We can’t say we’re big fans of homeowners’ associations around here, as they tend to be garbage busybodies who insert their nose into your project car. One even recently decided to hassle one of the most infamous builds in 24 Hours of Lemons history—the running, street-legal Upside-Down Camaro. Hilariously, this is one of the few Lemons cars that fits that definition. 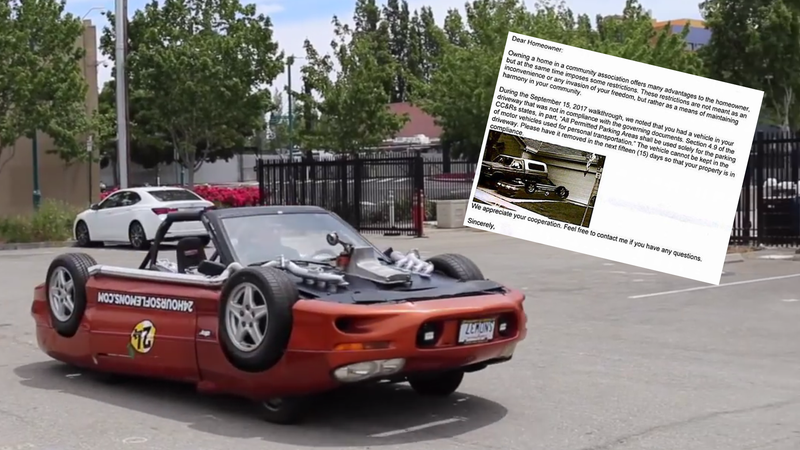 Jeff “Speedycop” Bloch’s infamous Upside-Down Camaro build sits on top of a running, driving 1990 Ford Festiva that’s been modified to wear the Chevrolet Camaro shell like a giant pair of car-pants. Bloch is one of the most famous and notable people to compete in the whimsical budget endurance racing series. Over the years he’s built cars that look like a plane, a helicopter and the station wagon from National Lampoon’s Vacation. Apparently, going upside-down is too far this time. Alloy Motors even recently made the creation California emissions-legal, Speedycop told Jalopnik. Lemons featured a video of it running around in California after the street-legalization, as it’s been on that side of the country with the Lemons series organizers for a while. Racer Dave Montoya was the unlucky recipient of the request from his HOA, as he’d borrowed the Upside-Down Camaro from Lemons HQ for an event. Montoya had the perfect response to the nastygram he received about a perfectly functional (albeit weird) car. “Told them to piss off,” he told Jalopnik. He also said he’ll be sending them a link to footage of him driving the car down the freeway, just for good measure. Hey, homeowners’ associations! If you see something this weird in the future, it might behoove you to simply Google it first.